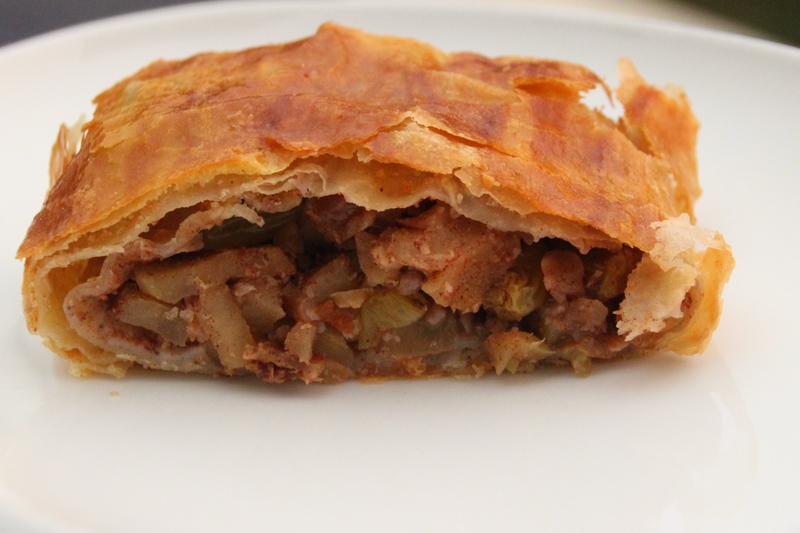 GENUINE APPLE STRUDEL (this recipe relates to my story of “Aldar and the Golem of Prague”). It takes a lot of preparation, but it is the real Austrian thing. Dried bread crumbs to sprinkle. Mix the dry ingredients (flour and salt) in the bowl of an electric mixer or large mixing bowl. Mix the remaining dough ingredients (the wet ones) in a small mixing bowl. Slowly add the wet mixture to the dry ingredients while stirring. After you get a firm ball, let it rest for 10 minutes to allow the flour to fully absorb the fluids. On a floured surface, kneed the dough by hand for 10 minutes, or you can kneed with a pasty arm of a heavy duty mixer. Form the dough into a ball, place on a floured surface, and let it rest of one hour. You can prepare the filling toward the end of the time period. Place the raisins in the bottom of a medium mixing bowl. Optional: add the schnapps, and allow to soak for about 30 minutes. Peel and core the apples; slice into small pieces (1cm), and add to the raisins. Add honey, cinnamon, and nuts. Mix well. Spread a nap-less large pastry towel on a hard counter. Place the small dough ball to be used on the cloth, brush its top with melted butter. Roll it out into a 1/8 inch (3 mm) thick piece. Brush the top surface of the dough with melted butter. Working to get the dough into a rectangle, roll out the dough again to 1/8 inch thick. Repeat steps 6,7, & 8 three or four times. Each time rolling to 1/8 inch thick. Enlarge the sheet of dough to about 16 inches (40 cm) by 24 inches (60cm) long. Do this by using a combination of hand stretching and rolling. Preheat the oven to 450oF (230 C). Prepare a supply of melted butter (about half a stick-4 oz), plus a beaten egg. Brush the dough generously with melted butter then sprinkle lightly with bread crumbs. Distribute the filling mix along one short edge of dough in a 3 inch (75 mm) wide row. Leave 1 inches (2-3) cm at each end free of filling for later sealing. Lift the short end of the pastry towel near the filling and begin rolling the dough around the filling. After each roll over of the log, brush the top with butter. Continue rolling until the dough is completely wrapped around the filling. Use some egg wash to seal the ends of the roll. Using two large spatulas, transfer the roll to the pan, seam down. Brush the roll with egg wash. Turn oven down to 400oF (200 C), add egg wash again, continue baking for an additional 20 min. Check every 5 min or so until sufficiently browned.